If you haven't already done so, host an Open House to promote your club. Provide snacks, everyone loves snacks! Organize a Business Awareness Campaign. This is particularly useful to corporate/government clubs and community clubs in business neighborhoods. Work through the Moments of Truth program with your club. This will be especially useful if your club has been missing it's *sparkle" recently, and you want to get back to the basics of excellence. Follow the directions on this flyer (PDF) and post your video to the District 55 Facebook page, and you'll be entered into a drawing for a $50 VISA gift card for your club! ​We have added a new club to our District 55 Toastmasters Community as of March 29th – Southside Speakers! Steve Lockwood PDG/DTM and Erica Lockwood DTM, a wonderful couple who met in Toastmasters 10 years ago at the Speaking of Liberty club in North Austin moved to South Austin a year ago and noticed there were no clubs in the Slaughter/I-35 area. They put together a demo meeting on 1/22 and by 3/26 (meeting #10) had the 25 members they needed to charter. Their membership consists of 7 dual members, 6 reinstated members, 1 transfer, and 11 new members. Getting 10 signed up at the demo meeting and 15 over the next 9 weeks was a rapid pace but almost every guest has joined. The club will meet Tuesday evenings at DK Maria’s Legendary Tex-Mex at Slaughter & Manchaca. Social time is 6-6:30 pm and the meetings run 6:30-7:45 pm. Due to the club’s close proximity to Kyle and San Marcos, the club is aligned to H41, to hard working Area Director Alan Shinn, who is also one of the club mentors. The other club mentor is Jen Soto, a former Area Director and member of Austin Toastmasters. Club sponsors are Erica Lockwood and District Administration Manager DJ Cardamone. Next year the club will be realigned into I54 with other clubs in south/southeast Austin. The charter party will be held Tuesday, April 23rd at DK Maria’s. All are welcome! Congrats to the Southside Speakers team, and welcome to District 55! ​Toastmasters strives to empower individuals through personal and professional development. In the day-to-day activities of a club, it can be a challenge to know where you place your club's focus. Fortunately, Toastmasters provides a way for clubs to track their progress towards excellence. The Distinguished Club Program (DCP) offers a set of goals for which to strive. Win a Very Amazing and Unforgettable Time with the Golden Lady! 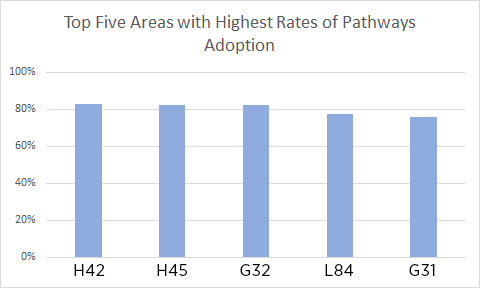 ​The average rate of adoption of Pathways in District 55 is over 63%. There are several clubs in which 100% of members are enrolled in the program. Five areas, listed below are leading the way in adoption with over 75% adoption. We have added a new club to our District 55 Toastmasters Community as of March 11th - HDR San Antonio Toastmasters Club. HDR San Antonio Toastmasters will meet 1st and 3rd Wednesdays at noon, at their campus on Northwest Loop 401 in San Antonio. Membership is restricted to HDR employees. The club is aligned in Area H44, and will be supported by Doug Kelly and Keng Chester as new club mentors, Bill Friedrich and Sandy Watson as sponsors, and Darla Peek as Area Director. Congratulations to new Club President, En Weng. ​We just added a new club to our District 55 Toastmasters Community as of February 25th - NanoToast Toastmasters (club # 7294562). 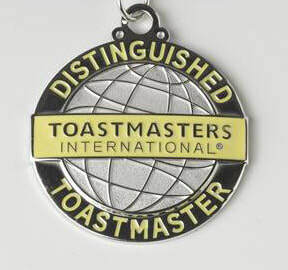 NanoToast Toastmasters will meet Wednesdays at noon. Membership is restricted to CNT employees. Congratulations to new Club President, and club sponsor Steve Burns. At our 2019 Annual District Conference, our goal is to offer members education sessions that inform, entertain and broaden their Toastmasters’ experience. Education sessions are one reason people attend conferences. Typically, a conference will have 5-10 sessions offered. If you have a session you would like to submit for selection please fill out the application (on the right) and send it back to EducationSessions@tmd55.org NO LATER than end of day February 20th. Decisions will be made and communicated out by March 15th. For this conference’s education sessions, we are sticking with a core theme of solving the most popular problems Toastmasters face. Below you will find the main topics we are looking for presenters to fit under. While it is not necessary to have a presentation that fits within these topics below, we would like to stick to similar themes. We ask that you make sure that your session remains interactive. We want the audience to be actively participating in the discussions. The sessions will be 40 minutes with additional 5 minutes for Q&A and 5 minutes for introductions (50 min total). ​Please click here for the application if you would like to be a presenter (Word DOC). Effective immediately, any club coach who has already been assigned, and any new club coaches that are assigned before June 30, 2020 will not only receive credit toward their ALS, but they will also receive the required year of district leadership credit to achieve their DTM. 2019, the year of the Wow, is upon us… are you ready? 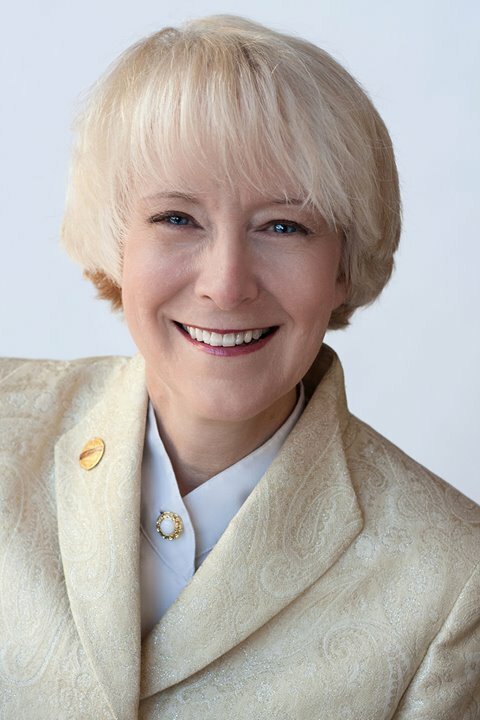 I ask you to ‘Wow’ your current and prospective Toastmaster members with the best club experience possible. Welcome to The Wow!Factor Project! The goal of this program is to increase the quality and performance of each club around the world. When you visit a McDonald's anywhere in the world, do you expect a consistent experience? Toastmaster members and guests have a right to expect a consistent, quality club experience anywhere around the world, too. Let’s raise the bar of every club across the globe to be more uniform and top-performing. Let’s make this our gold standard! Do you aspire to be recognized for achieving DTM at the 2019 spring ceremony? Alamo Toastmasters will meet 2nd & 4th Thursday at 12pm. The club is aligned in Area F23, and will be supported by Michele Riboul and Wilma Igwe as new club mentors, and Michele Riboul as Area Director. The following clubs earned distinguished status during the 2017-2018 Toastmasters year. We just added a new club to our District 55 Toastmasters Community as of November 19th - Aurigo MasterWords (club # 7219118). Aurigo Software is a global software company headquartered in Austin, that provides capital program and project portfolio management software solutions for large capital infrastructure owners in the public and private sectors (including ports, city governments and state transport departments). (wikipedia). The club is named after Aurigo's best-selling product - Masterworks. Aurigo will meet 1st and 3rd Thursdays each month, at 4pm. Membership is restricted to Aurigo employees. The club is aligned in Area K75, and will be supported by Miriam Mora and Fernando Hinojosa as new club mentors, and Balu Muthuvulu as Area Director. Congratulations to new Club President, and club sponsor Manish Sharma. ​Bart Loeser is a professional trainer and dedicated Toastmaster for eight years. Bart and his team are offering multiple educational opportunities each month to help members in District 55 sharpen their skills and hasten their progress along their route to success in achieving the goals that are available through Toastmasters. How did he do it in a record amount of time? He reveals his secret in this excellent video. Find out what level of commitment and motivation it took to reach this Level and hear his words of advice. Let's watch and learn! Click here for assistance along your Pathways journey. We encourage you to take advantage of the many opportunities our District offer for you to acquire/strengthen your leadership skills. You can take on a leadership role at your Club or District. 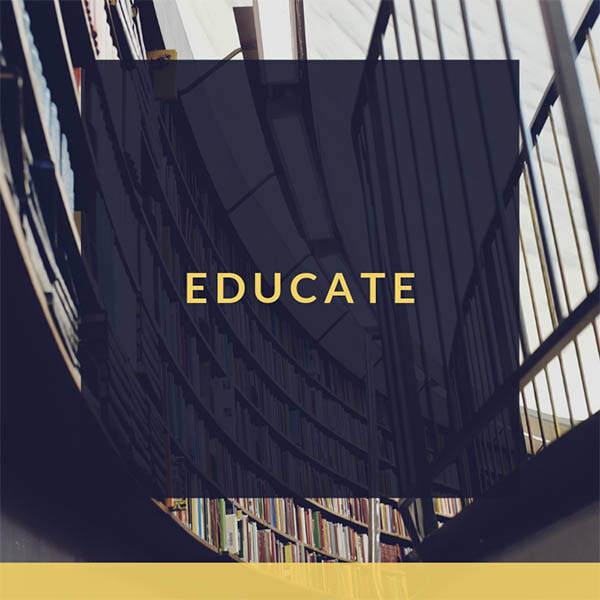 You can also conduct specialized workshops to help other Toastmasters or your community using the modules and workshops shown below from the legacy education program. Pathways has leadership opportunities within the various Path projects. Participate in these leadership programs will satisfy some of the requirements toward achieving your Distinguished Toastmaster (DTM) status: Pathways DTM (serve 12 months) or Competent Leader (serve 6 months). Some club elect new officers every six months, while other clubs hold elections once a year. This usually depends on whether the club meets weekly or biweekly. Additionally, you will acquire/hone leadership skills that will help you in your profession such as teamwork, project and time management, motivation, mentoring and conflict resolution. These leadership opportunities will also allow to expand your networking and help you advance in your career. Serving as a club officer will enable you to develop valuable leadership skills while also assisting your fellow Toastmasters. To help you prepare for the role, District 55 sponsors a number of Club Officer Training sessions to discuss your duties, best practices and resources. If you are interested in a joining our District leadership team, please let your Area or Division Director know. You can also contact the current District Director at d55dd@tmd55.org. We're in good company. You'll be hard pressed to find an occupation that cannot be enhanced by the skills learned in Toastmasters. Many well-known people from various fields have been Toastmasters, including, Napoleon Hill, James Lovell, Leonard Nimoy. ​Join us for a live and interactive presentation on the Pathways Learning Experience to help you better understand the process and walk you through the first level. To get started promoting your club’s Open House, take a poll of current members and visitors. This way your club does more of what works! Toastmaster pin/Name Badge—wear at work/to events. When asked, they present an opportunity to extend an invitation to the Open House. Local Newspapers: Submit articles with photos for Open Houses, contests, member accomplishments, noteworthy guest speakers, training programs and roles in community affairs. Website—on TI listing under Find a Club: ensure that club contact and location information is correct and your club’s landing page is also current with pictures and contact information. Elevator Speech and Success Stories—train members to talk about Toastmasters. When it comes time to invite others to an Open House, they will be ready, having trained in advance. ​Tips, Tools, Templates, & Techniques | All members may attend! You've been asking for it -- ways to boost the attention your club gets and grow your club! The Virtual VPPR Visit is a six-week, one-hour discussion and Q&A on a Zoom Video Conference call, featuring PR and marketing savvy co-hosts. These virtual visits will deliver time-tested tips, tools, templates, and techniques club members can put to use immediately. ​For the first time, the Fall District Council Meeting will be virtual! The business meeting will be conducted using Zoom Conferencing on Saturday, September 22 at 10 a.m. The registration process and Zoom link will be available at least a week in advance. Here are the latest clubs to charter in the 2017-2018 Toastmasters year. Bilingual Lady Toastmasters meets on Wednesdays at noon, at Genuine Joe's Coffeehouse at (2001 W Anderson Ln, Austin, TX 78757. This Club was aligned in Area L82. Congratulations Valerie Chavez and Jose DeLaRosa for successfully supporting the chartering of this club.